This post was originally published on Autism Art Project at http://autismartproject.blogspot.com/2013/04/1000-ausome-things.html and is reprinted here with permission from the author. I used to think that preschool graduations were ridiculous. That was before Derek. That was before autism. They say a picture is worth 1000 words. My son doesn’t have 1000 words. By definition, Derek is still considered “non-verbal.” Does that matter? Not at all. Derek has found ways to communicate. If he can’t find the words verbally, he’ll take my hand and show me what he wants or point to things. If you ask me, his smile alone speaks volumes. So do his eyes. I couldn’t possibly be more proud of this little boy. He deserves a cap and gown. He deserves cake and ice cream. He deserves all that I have to offer as a parent. He deserves every opportunity that the teachers and the school can provide. I really like to play on the computer, mostly Garry’s Mod. I have 3 cats, a dog and a bunch of fish and I really like animals. I really love Jolly Ranchers. I have a great memory and I like to learn new things. I’m just a regular kid, but you may have noticed that something about me is a little different. My doctor says I have Asperger’s, which is a kind of autism. I’m not sick. I’m not contagious. My brain is just ‘wired’ differently. It’s like it has a short circuit; sometimes it’s on, sometimes it’s off, and sometimes it misfires. I have to think about a lot of things that I do, things that other kids can do without even thinking about them, so that takes more time for me to figure out. It can be really hard for me to explain what I mean, or understand what someone else means.. When I start saying something it’s really hard for me to stop until I finish the comment or statement. Sometimes I can act a little weirder than I am – I don’t know when to quit – I can’t change gears very fast from one thing to another, or from one thought to another. My hearing is extra-sensitive. It’s like everything is either too loud or not loud enough, so sometimes I make noises because it helps me to feel better. I don’t know why. I just do. I don’t mean to make people uncomfortable when I get too close or when I look at them too long – I’m working on not being clumsy and not getting in people’s personal space. I like things to stay normal – change is hard – I don’t really like surprises – little things can bother me, like noises and movement. I’m trying to learn how to act right and be a friend, but I have a hard time getting along with other people. If I ever offend you, you should tell me right away because sometimes I really don’t know when I’ve done something upsetting or silly. Please be patient with me while I keep learning. My Asperger’s does not make me any less special than anybody else, but it also does not make me more special, just different. If you ever have any questions about Asperger’s, you can look on-line, or it’s perfectly okay to ask me! The more I talk about it the more I figure it out. If I don’t know the answer I’ll find it out and get back to you on it! This post was originally published by Jessi Cash on Deciphering Morgan at http://www.decipher-morgan.com/2013/04/his-ausomeness.html and is reprinted here with permission from the author. *Just a final note for Autism Awareness and Acceptance Month. Figured I’d bookend the month. That isn’t a typo in the header. “Ausomeness” or being “ausome” is being Autistic. It’s being my son, or like him. Of course, I’m biased, but I’m told by pretty much everyone who comes into contact with Morgan that he’s an ausome kid. You know what? He’s going to grow up to be an ausome man, too. My son doesn’t see bad in people, not that I’m aware of, and if he does, he doesn’t say anything about it. Well, if he sees you breaking the rules, he’ll say something. I’ve been there. I know how easily one internalizes society’s prejudices toward disability, and I’ve been fighting it for years now. It’s okay. I’m not quite ready to say it gets better, to be honest. I’m living alone in a small apartment in a small town, underemployed and constantly worrying about money, and moreover, about my future. But I can say in the past few years, I’ve had some fantastic friends. In my last semester of college, my friend Aurora said that getting to know me was the highlight of her, and her friends’, semester. The world that seemed so daunting and confusing a few years ago is only half as daunting, half as confusing now. So I’m not going to be insensitive to the challenges we autistic people face today, but I can say that our lives have so much capacity for growth and change, and in our darkest hours it might be all too easy to forget that, but it’s still true. The world has capacity for growth and change too, and if we all work together, we can change it. This post was originally published on livinautistic, at http://livnautistic.wordpress.com/2013/05/01/livnautistic-celebrates-1000-ausome-things-autismpositivity2013/ and is reprinted here with permission from the author. I found out I’m autistic almost 2 years ago. It was the BEST MOMENT of my life. Don’t get me wrong. There are plenty of wonderful moments in my life. But in that moment, it was simply Ausome! In that moment, I felt like Clark Kent. In that moment, I was no longer a lonely stranger wandering in a strange land. In that moment, I found my true identity. In that moment, I had a true sense of belonging. In that moment, my life took on a much more meaningful purpose. In that moment…I’m not going to list all the 1000 Ausome things I had in my life since I made the self-discovery, but I’m proud to say, finding out I’m autistic completely changed the direction of my life. I used to be a unhappy person. Like many autistic people, I once was totally lost in this world. I was the cat who thought itself as a dog. I thought I was a neurotypical and I was ashamed of my neurological difference because I thought them as my weakness. I tried my best fitting into this neurotypical world but it wasn’t very successful. I felt I have to consistently apologize for whom I am. I felt I was somehow different but I didn’t know why or how. And because of that, I was angry, defensive and very insecure. Finding out I’m autistic changed the person I am. It helps me to understand why I am different. I began to know myself better. I became mindful of my own being. I changed my self-perception. No more negative feelings of doubt and guilty. What takes its place is self-accpetance. Now I can concentrate my energy on living positively — how to work around my weakness and utilize my strengths. I’m no longer disabled by my sense of worthlessness. I know now, I am who I am. I’m aware. I have finally come to my own self. At last, I found the key to my true happiness. As part of my self-discovery, I looked around for other autistic people like me. And I have found them. There is a huge autistic community on Facebook. There are many of us. We share our stories, our interests, knowledge, support and camaraderie. We talked, we joked, we laughed and we celebrated. I’m no longer alone. We are no longer alone. We have each other. Is that not the most Ausome thing in the world? In days to come, I hope to meet my autistic friends face to face. I look forward for new adventures and new friendships. My son is 7 right now and I am looking forward to introducing him to the autistic community. There are so many wonderful things we autistic people can do. Together we will build a better world for our future generation. And that is Ausome! This post was originally published by Rose at The Caffeinated Autistic at http://thecaffeinatedautistic.wordpress.com/2013/04/30/the-caffeinated-autistic-celebrates-1000-ausome-things/, and is reprinted here with permission from the author. I meant to write a post on my birthday (a week ago today) and failed. April is always a difficult month for a variety of personal reasons, but it’s become even more so with the knowledge that April is Autism Awareness month. I have seen far too many blue puzzle pieces or rainbow puzzle ribbons. But today isn’t about that. Today is Autism Positivity day, and I’m going to tell you the best things about being autistic, for me. 1. Obsessions. I never really understand why people consider this a negative trait, and refuse to allow autistic children to indulge in their obsessions, rather than using them as an opportunity to learn (or even maybe as a reward if it’s difficult to use it in education). If you meet me in person, I can guarantee you that at some point in time, I will launch into an infodump about why Sherlock Holmes is autistic, why all the female characters are amazeballs, why Susan Pevensie’s ending was the saddest thing I’ve ever read and why I hate C.S. Lewis for what he did to her, and why platonic friendships in all sorts of media aren’t specific to gender and are amazing. Just to name a few. 2. Stimming. There is angry stimming and panicky stimming, and the cause of these is no fun, but stimming itself is AWESOME. And I’ve handflapped and rocked in happiness and contentment and drew patterns over the skin of a fellow autistic person. And co-stimming with another autistic person is by far one of the best things to do. 3. Another way of thinking. This isn’t very concrete, but I find more and more that I think I’m thinking in a similar manner to a neurotypical person, but then I mention what I’m thinking out loud and yeah, I’m not. But so many times, this means I have the solution to a problem that no one else thought of, and sometimes? This makes the life of an autistic child better because their parents get it because I was able to articulate it. 4. Repetition is amazing. This applies to so much and has to do with echolalia as well as repetitive movements like stimming, but also? It is why I am good at my job. I’ve been employed for just 2 1/2 months, and you’d think that isn’t even long enough to be good at my job, but I’ve already been training people. I’m fast and accurate and no one at my job but me likes being in the back because it’s boring, and yeah, when it’s slow, it is, but it’s repetitive and perfect and lovely. 5. Language. Language and words are fantastic and I’ve been an avid reader since I learned right before my 4th birthday – when I apparently taught myself. I was reading at a post high school level in the 2nd grade, and I was often in trouble for trying to read novels behind my science textbooks. I majored in English in college, and even taught it myself for two years (a job that I found too stressful because of red tape and paperwork). I love words, and I love what they can do, the images they can evoke, or the things they do to my ears when they’re spoken. There’s a segment from an episode of Sesame Street that includes the phrase “lilting Liliputian lullaby”, and isn’t that just the best thing to say and hear? This post was originally published by Tripped Up Mommy on The Tripped Up Life at http://trippeduplife.blogspot.com/2013/04/the-tripped-up-life-celebrates-1000.html and is reprinted here with permission from the author. Today I’m participating in the Autism Positivity Project Flash Blog by celebrating two of the most “ausome” parts of my world: Angel and Princess triplets. 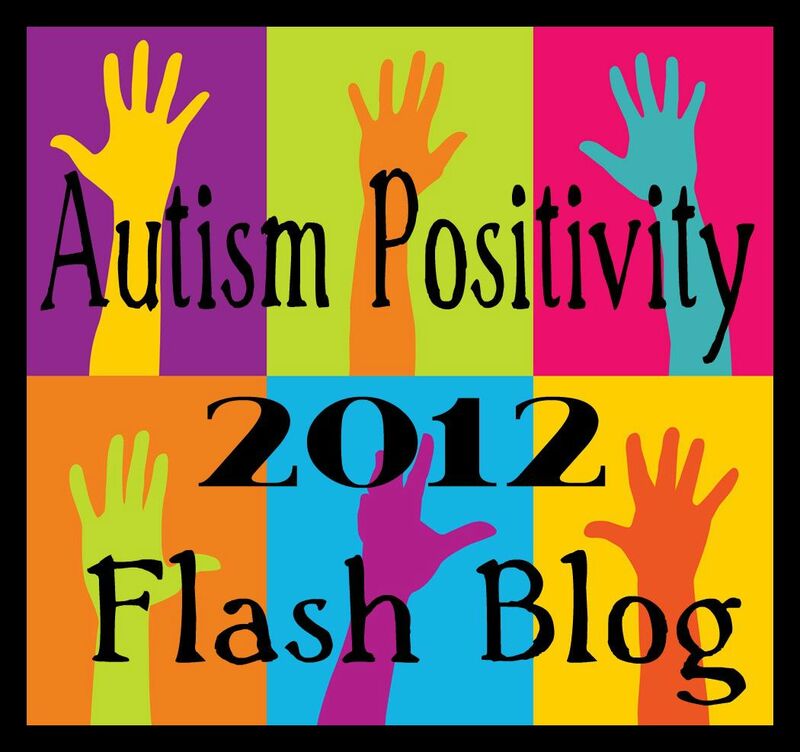 This flash blog is about showing the world the positive side of autism, the acceptance part of autism. And, on the last day of Autism Awareness month, I felt it was important to participate in – even though I’m really late in the day. Here is a description from the author of The Third Glance blog, who is one of the major organizers in this effort. I couldn’t have explained it any better than this: Last year hundreds of bloggers came together in a show of support and solidarity in response to an anonymous person’s Google search “I wish I didn’t have Aspergers”. The posts that came flooding in from all over the world were a beautiful example of the power of strength in numbers. With so much negativity still surrounding Autism and the misinformation and misconceptions that continue to abound, we invite each of you to share one, or two, or more “Ausome” things! No matter how difficult life can be when raising triplets, two of which have neurological differences which make communication extremely difficult, there’s never a day without moments of pure and overwhelming love and pride in my children – all my children, those with autism and those who are neurotypical.